Paris has the Eiffel Tower, London has Big Ben, San Francisco has the Golden Gate bridge, and Bangkok has Wat Phra Kaew and the adjoining Grand Palace. These gorgeous architectural delights are clad with blinding gold exteriors, ruby red and emerald roofs, and sparkling mosaic walls. For a complex that was built in 1782, Wat Phra Kaew truly showcases the splendour and might of the Siamese Kingdom of old. Wat Phra Kaew means the Temple of the Emerald Buddha and the main building (located in the centre of the main walled complex and surrounded by worshippers seeking protection or good fortune) is in essence the thrown room of this tiny statue. The Emerald Buddha is actually made of jasper rather than emerald and is only 76 centimeters (30 inches) tall. The statue itself has an interesting history and first appears in confirmed Thai records in around fifteenth century Chiang Rai. However, according to recorded legends, the statue appears to have been carved in 43bc in India, and was eventually smuggled to Sri Lanka to avoid it being destroyed or stolen during the Indian civil war. In 457 the image was to be delivered as a gift to Burma to support the spread of Buddhism, but due to storms and shipwreck, it ended up in the hands of the Khmer empire until the Siamese invaded Angkor Wat in 1432. After being housed (and even hidden under plaster) in various locations around Thailand, the Emerald Buddha is stolen by Laotian invaders in the 16th Century, but then General Chao Phraya Chakri retook the image during Siam’s war with Laos in 1779. 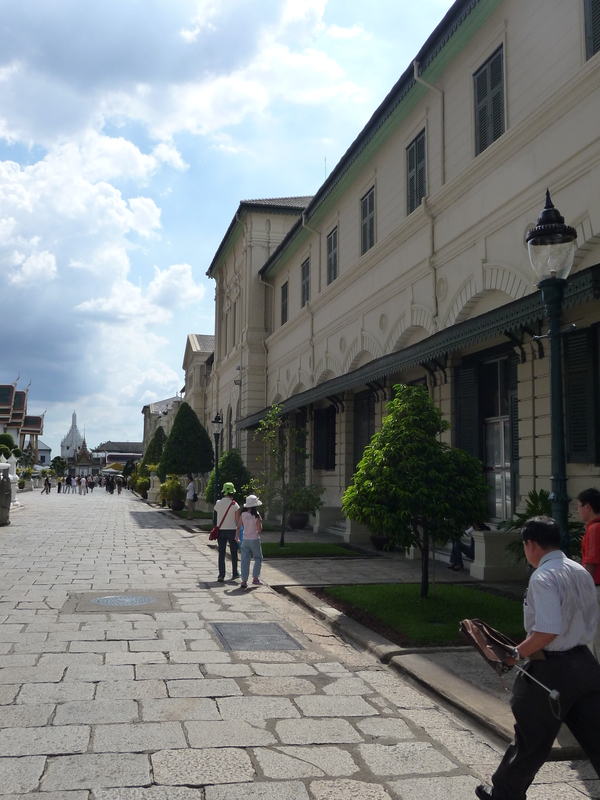 It was housed in Thonburi (near the Temple of the Dawn) until the capital moved to Bangkok. 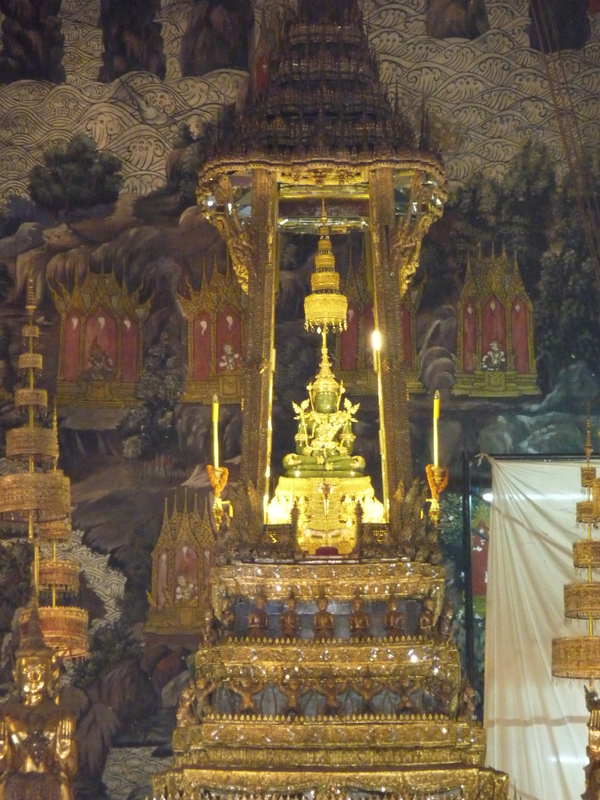 The Emerald Buddha… Thailand’s holiest religious icon. Although small in size compared to Thailand’s many other Buddha statues, the Emerald Buddha is Thailand’s holiest and most revered statue. At the start of each of Thailand’s three seasons (Cool, Hot, and Rainy; starting in about November, March and July) the Emerald Buddha’s garments are traditionally replaced by the King of Thailand in a royal ceremony to pay respect to the Emerald Buddha and to mark the start of that season. In more recent years, the garments have been changed by a representative of the King. In addition to the Emerald Buddha, Wat Phra Kaew offers many other interesting sights and photo opportunities. The complex is massive, spanning 94 hectares and housing around 100 buildings. Just walking around the complex, being overloaded by the dazzling structures and statues, is a real pleasure and I always feel like I have been transported back in time to an age of silk, opium and spice traders, golden courts and European emissaries negotiating trade treaties with Asian empires. My personal favourite attraction in Wat Phra Kaew is the massive mural of the Ramakien which is painted onto the inside of the main wall surrounding Wat Phra Kaew (don’t confuse this with the outer protective wall surrounding the overall complex). 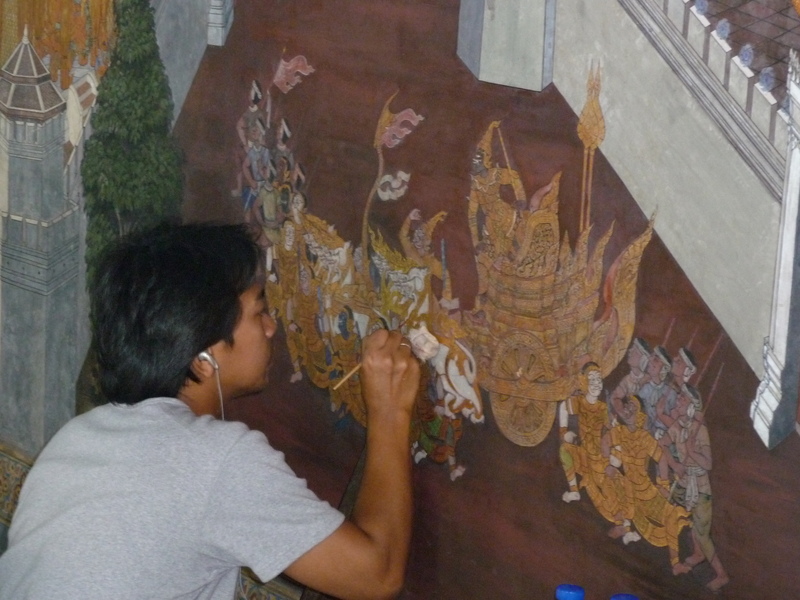 The mural is about 2km in length and tells the Thai version of the Hindu Ramayana (which is the story or Narayan/Vishnu). Because the paint degrades over time, you will notice that university art students situated around the wall, forever restoring the mural. Various angels, demons and other mystical statues adorn the complex. 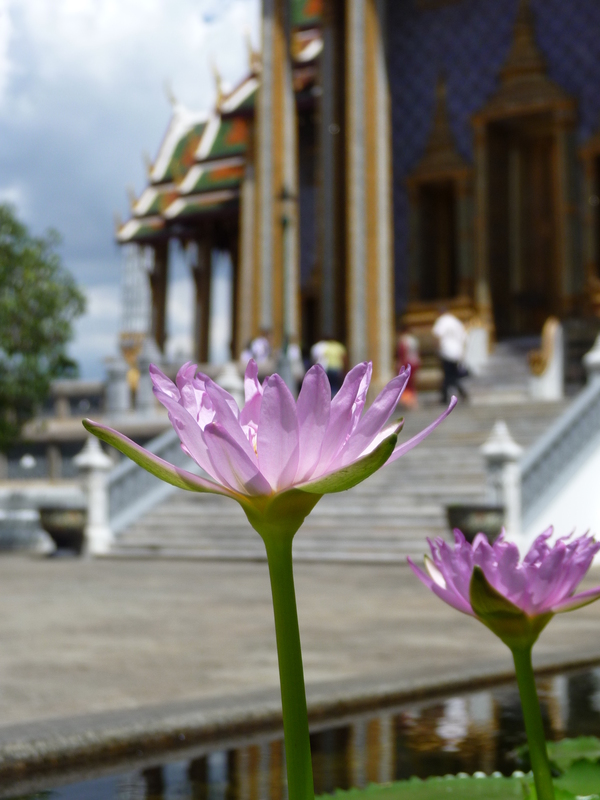 The temple of the Emerald Buddha is in the background. Many of the characters from the Ramakien can be found as statues around the complex. Those that I always find to be quite thrilling are the giants (“yak” in Thai) that flank many of the gates. In addition, you will find angels, demons and monkey gods scattered around. Beyond the Ramakien, there are many other statues and carvings of interest that give some interesting clues as to what life was like 200 years ago in Siam. Keep an eye out for the statues of the Europeans. These provide a good representation of how the Thais viewed the Europeans of the time. 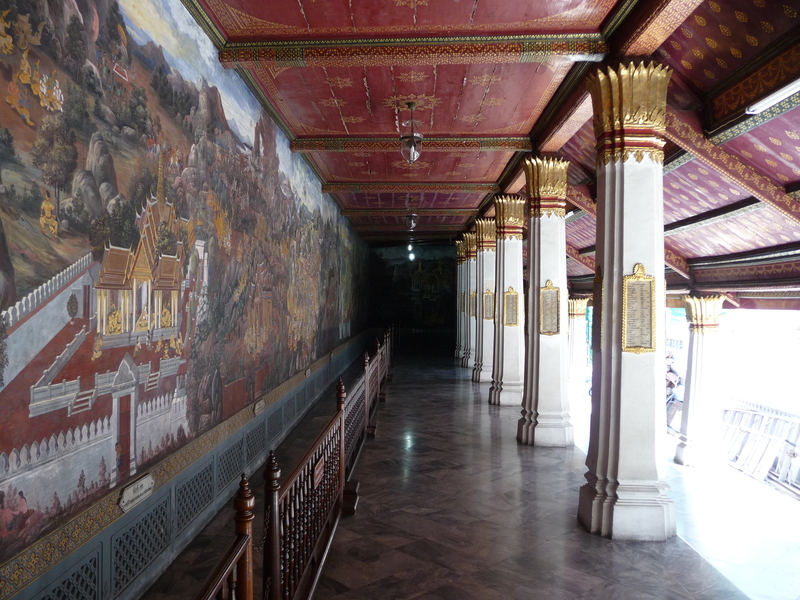 The Ramakien mural is 2km long and surrounds the inside of the main wall around the temple. An art student restoring a faded part of the mural. Wat Phra Kaew is the holy part of the overall Grand Palace. 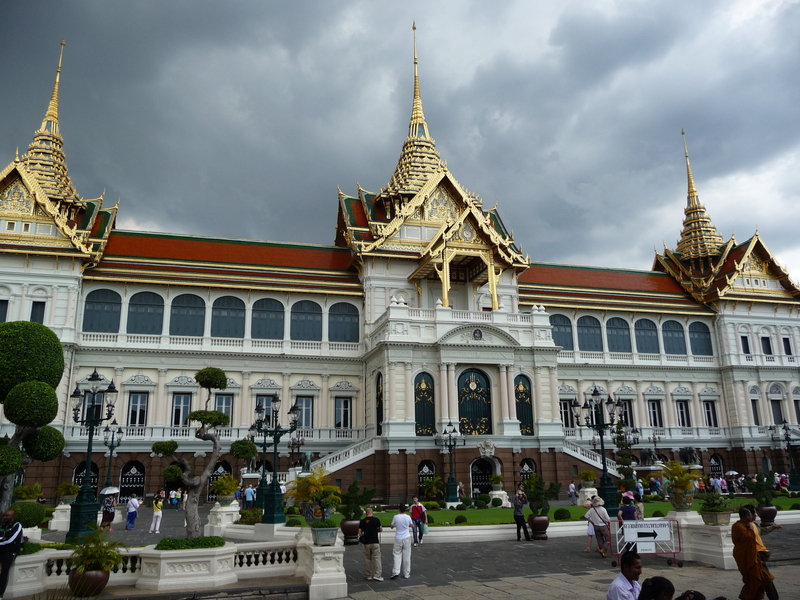 The Grand Palace itself was where the Kings of Siam lived, and a good portion of the Grand Palace is open to the public. Although the Grand Palace is the official seat of the ruling Chakri dynasty, the present King of Thailand lives in other palaces (his most favoured being Dusit Palace in Bangkok and “Far From Worries” Palace in Hua Hin). However, the Grand Palace is still used for royal functions and ceremonies and at times may be closed to the public because of this. While Wat Phra Kaew presents a very interesting view of Thai religion, the Grand Palace depicts a lot about the history of Thai royalty and in particular the Chakri dynasty. The current main building of the Grand Palace wasn’t completed until 1882, but there are many other palace buildings that were built before this, including as early as 1782 (when Wat Phra Kaew was completed). As a result, you will notice a shift in the architectural styles of the different buildings, ranging from early Rattanakosin (which is similar to the later buildings in the former Ayuthaya capital) to more modern architecture which adopts some strong European elements mixed in with Thai highlights and decorations. Wat Phra Kaew and the Grand Palace are located on Rattanakosin island, on the banks of the Chao Phraya River. This is a man-made island, with moats dug around in order to fortify and protect the palace against potential invaders. Being the old part of Bangkok, there is a reluctance to ruin the old-world ambiance of this part of town by building modern elevated transport infrastructure. As a result, the best way of getting to Wat Phra Kaew is via Thailand’s traditional transport infrastructure, by water. Accordingly, take the skytrain (BTS) to Saphan Taksin station. Then go down the stairs towards the river and you will find the Saphan Taksin (aka Sathorn) ferry pier. From here you can catch the orange river express (heading up-river to Nonthaburi) or the slightly more expensive tourist ferry and get off at the Grand Palace at Tha Chang pier (or if you also want to go to Temple of the Dawn, then get off at Tha Tian pier). You can also charter your own boat or buy a guided package tour, although you will pay a lot more for the privilege. The orange river express will cost about 15 baht (each way; but buy a ticket on the boat rather than from a ticket kiosk to get this price), while the tourist ferry costs 150 baht for an all day unlimited ticket (but only stops at about 8 different piers) and offers guided commentary during the trip. The entry fee into Wat Phra Kaew and the Grand Palace is 500 baht for foreigners (Thais get a significant discount, but for them it is a place of worship, while for tourists, its just an attraction to take photos of). After you purchase the ticket, make sure you keep the stub as you can use it to enter certain other historic sites nearby, such as Vimanmek Teak Palace. You can also book yourself into a guided tour time slot (which is part of the ticket price, although people do give the guide a small tip). When you buy tickets, make sure you walk all the way up towards the main entrance to the palace and only buy tickets from the official ticket office housed in the building. Over the years there have been many scams involving ticket sales where unofficial booths were set up near the road selling tickets and tours at inflated prices. In addition, you will also get tuk tuk drivers and “officials” that sometimes tell you that the palace is closed due to a government holiday and they will then offer to take you to another attraction that is open. If you go with them, they will take you on a very quick driving tour of a few attractions such as the Big Swing and Democracy Monument, and then take you to a gem store where high pressure sales tactics will be used to try to convince you to purchase gems at over-inflated prices. If you are lazy, or completely naive when it comes to getting around in Asia, then you can purchase a guided tour from any travel agent, which will include full transport from your hotel and the entrance fee. However, you may find the tour is too rushed for your tastes and in a big group it is difficult to get clear pictures without fellow travellers getting in the way. One of the mythical guards of the palace. Dress inappropriately and they will come to life and devour you! This is Thailand’s most religious site and you need to be respectful of that. Accordingly, there is a strict dress code. Shorts and 3/4 length pants are not accepted. Women should also not dress too revealingly, and wear more modest attire. If you forget, you can rent coverings from the ticket office for a 200 baht security deposit, but on busy days they run out and you would have to pay more to rent similar garments from the enterprising vendors nearby. Be mindful of certain buildings where you must remove your shoes. The temple housing the Emerald Buddha in particular is a shoes off zone. You cannot take photos from within the temple of the Emerald Buddha. You can take photos while standing just outside the doorway, but you will want a decent zoom lens if you want to capture a close up shot of the statue. 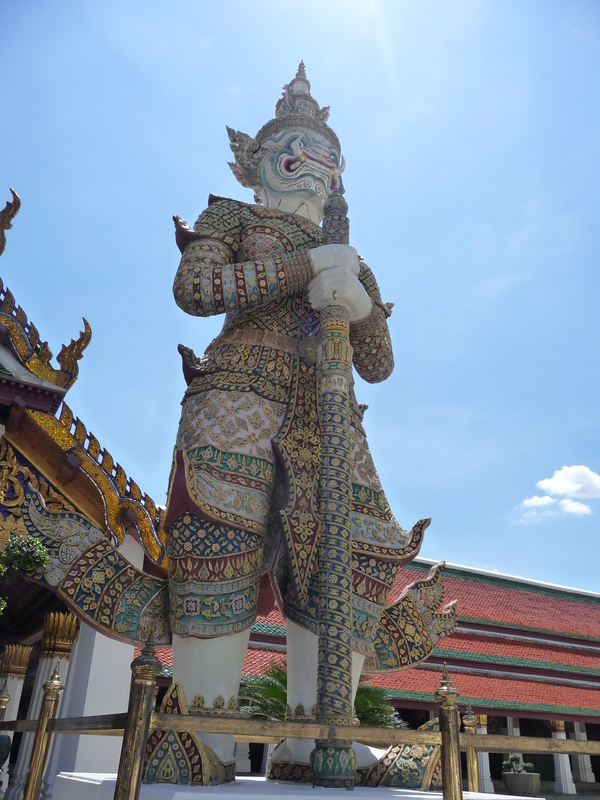 When inside the temple of the Emerald Buddha, never allow the soles of your feet to face towards the statue. The Thais consider the head to be the holiest part of a person’s body and the feet to be the dirtiest part of the body. Pointing your feet at a Buddha statue is a sign of significant disrespect. 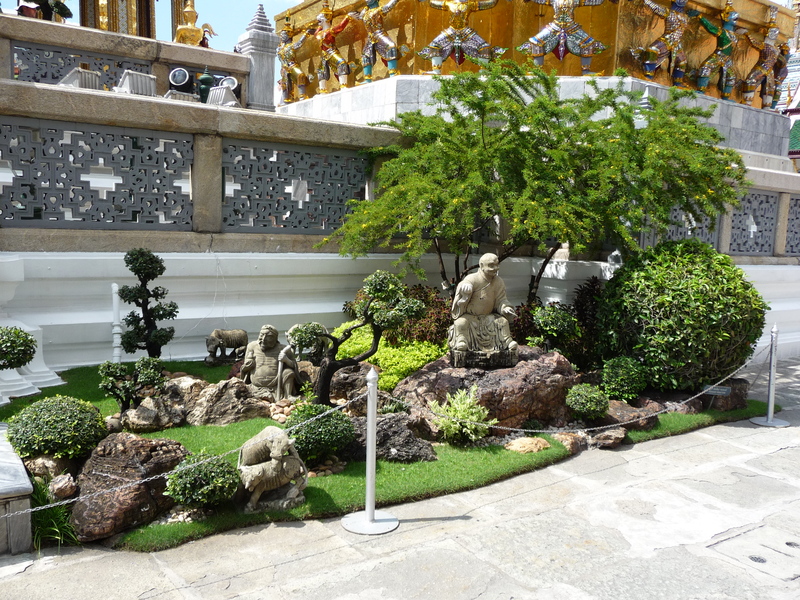 When taking photos, do not climb onto any of the statues, and for the more important Buddha statues, do not pose with the Buddha figure, as this is seen as disrespectful. In particular, do not try to take a selfie with the statue of the Emerald Buddha beside you. Other statues such as angels, demons, giants, lions etc are all fair game for group photos and selfies. Do not try to chip off any part of the temple, such as gold leaf, to keep as a souvenir. If caught, you will go to jail, as this is a serious offence in Thailand. The Thais are much more observant than you think and those security cameras are constantly being monitored… and yes, that Thai security guard did notice you trying to squeeze off a silent fart while you were pretending to adjust your camera. 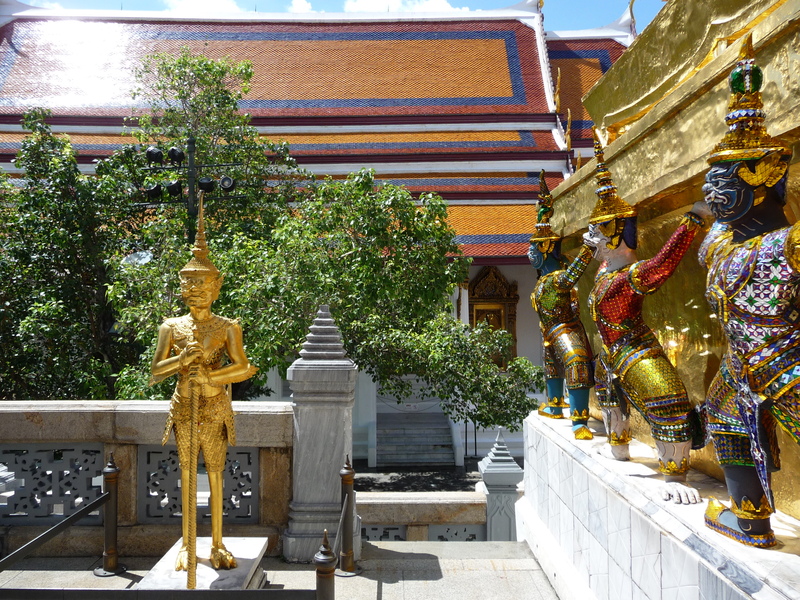 For every first time visitor to Bangkok, Wat Phra Kaew and the Grand Palace are the MUST SEE attractions. Yes, it may be a very touristy experience, but the complex is truly amazing and worth it. If you really do want to see it at its best, then go on a weekday, and get there as early as possible (it opens at 8.30am). Also, avoid the peak tourism season (late December, early January). 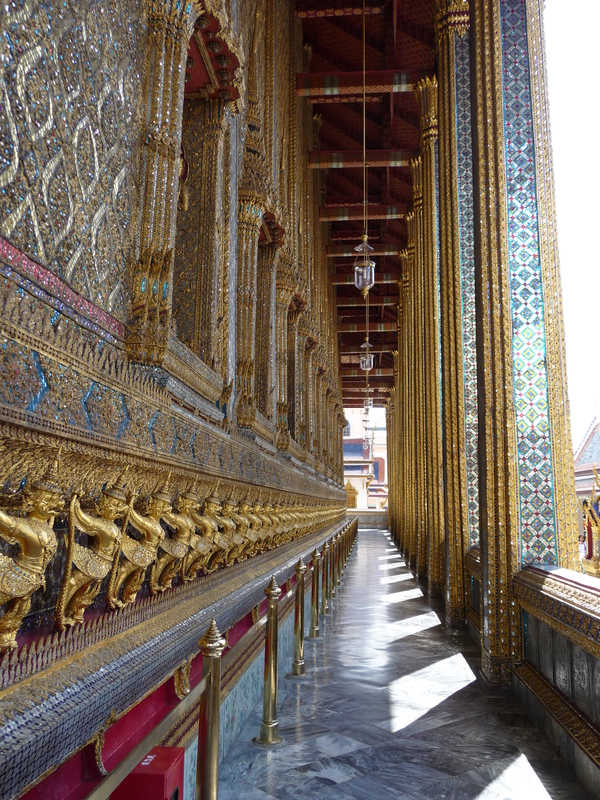 Photo of the side of the temple of the Emerald Buddha… notice the level of detail in the carvings and mozaics.